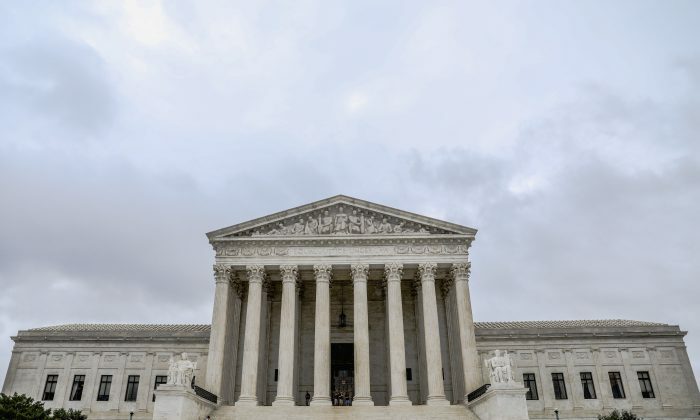 WASHINGTON—The Supreme Court has decided to review a Kansas Supreme Court ruling that held that only the federal government has the legal authority under U.S. immigration laws to prosecute illegal aliens for identity theft. Urged on by Kansas and the Trump administration, the high court agreed March 18 to take up what promises to be a politically fraught appeal in an age in which virtually every aspect of the American immigration system is controversial or under attack. The appeal comes as President Donald Trump battles Congress over his declaration under the National Emergencies Act that allowed him to divert monies already appropriated for other federal projects to the wall or border barrier he wants to build on the nation’s porous southern boundary with Mexico. Kansas and 10 other states want the legal authority to be able to go after illegal aliens for identity theft and other offenses when they work under Social Security numbers belonging to others. A victory by Kansas would give states more power to deal with illegal aliens, instead of relying on federal officials. “Identity crime is a problem that far exceeds the capacity of the United States alone to prosecute,” Kansas Attorney General Derek Schmidt stated in court documents. Court rulings currently prevent the states from prosecuting such illegals when the information relied on comes from a federal work authorization form, known as the I-9, which immigration authorities say is only supposed to be used to enforce federal criminal laws. The Immigration Reform and Control Act of 1986 (IRCA) made it unlawful to employ aliens who are not authorized to work in the United States, created an employment eligibility verification system, and created a civil and criminal penalty regime for employers who violate the law. In the cases of Ramiro Garcia, Donaldo Morales, and Guadalupe Ochoa-Lara, illegal aliens who sought restaurant jobs, the Kansas Supreme Court found the IRCA preempts the application of state identity theft, identity fraud, and making false writing laws whenever any of the information needed for the prosecution is contained in or attached to a Form I-9, even when the state prosecutes for use of that very same information in non-IRCA documents, the state of Kansas stated in a brief filed with the court. “It is Congress’s plain and clear expression of its intent to preempt the use of the I-9 form and any information contained in the I-9 for purposes other than those listed,” the Kansas Supreme Court found in the Garcia case. Kansas argued that it is absurd to prevent it from prosecuting in such identity theft cases, and that prosecutors didn’t rely on the form and instead utilized Garcia’s tax withholding forms, on which the stolen Social Security number also appeared. The “most natural reading” of the IRCA is that it forbids the use of the I-9 form itself and any appended documents, but not basic information like Social Security numbers that are also found on other forms.